I love books on self-sufficient living. They’re always packed full of useful information, and I get excited thinking about my future off-grid homestead. But I’m not there yet. Instead, I’m more of an “urban homesteader”, and I suspect most of you are too. I’m always looking for ways to lighten my footprint and save a bit of money at the same time. 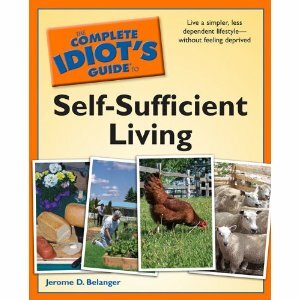 A few weeks ago, the publisher of The Complete Idiot’s Guide to Self-Sufficient Living sent me a copy to take a look at. They also sent two other awesome books on urban beekeeping and raising backyard chickens, which I’ll be reviewing soon. The book, written by Jerome Belanger, is like a basic “How To” guide for transitioning to a more DIY, homesteading mindset. This is the kind of book you’d want to read if you’re just getting into the green movement, or if you’re looking for some simple tips for saving money and going green. If you’re an advanced homesteader, or you’re living off-grid in the boonies, then good for you! But this book will probably be too basic for you. That being said, however, I consider myself a fairly established “greenie”. And I still learned some great tips from this book. There were some great gems hidden inside this book. For instance, in Chapter 16, Belanger has a great section on eating dandelions (which I love to eat!). But I learned something new here…that you can boil dandelion leaves, changing the water a couple of times, to eliminate the bitterness. And, I also learned exactly how to dig up the dandelion roots so they can be roasted in the oven, and then used as a coffee substitute. Think about how quickly your fruit and vegetables go bad. I don’t know about you, buy they go bad pretty fast in my fridge. I haven’t been able to figure out why yet. But I do know that they simply don’t last. So how do you think people kept things fresh before refrigerators? Well, they had root cellars. And it sounds as if root cellars were doing a better job than my Frigidaire keeping things fresh. That’s just a small sampling of what’s on that list. I can tell you right now there’s NO WAY carrots would last for 6 months in my fridge. I might get 10 days. Maybe. This section really hit home the point that I should have a root cellar, or even a “storage pit” as he calls them, at my house. If this Storage Guide is accurate, and I do it right, I could save a bundle on food because it wouldn’t rot before my eyes in the fridge. I’m now going to seriously think about putting something down in my basement…perhaps not a full root cellar, but Belanger says even a metal trash can with some insulation would work (yes, it’s more detailed in the book). There were a few places I thought the author slacked a bit, particularly the section on heating and cooling. Other than our mortgage, heating and cooling costs are our biggest expenditures. And yet this was one of the shortest chapters in the book. There weren’t any good tips for lowering these costs. Yes, he covered geothermal and Zero Energy Buildings, and we get a whole history lesson on how we used to heat and cool our homes. But what about the drawbacks and benefits of pellet stoves? What about crafty ways to find leaks in our walls? What about teaching us how to know how much insulation we need in our attic? I was really disappointed in this chapter. It could have contained so much useful information, and he really just glossed over it. So, thumbs down on this. So, do I think The Complete Idiot’s Guide to Sustainable Living worth the money? On the whole, yes. There ARE some really wonderful tips in here, especially on building henhouses, saving money at the grocery store, and gardening. Although it’s thick, it’s set up to be a fast read. But, most advanced greenies won’t find much useful info in here. This book would be most appreciated by readers just stepping into the green arena, or those who are thinking about buying land and trying to set up a homestead for the first time. FTC Required Disclaimer: I was not paid in any way for this review. I did receive a gratis copy for review purposes, and this copy is not expected to be returned.